papers on different topics in other courses. make or the point you want to prove. This is your own opinion that you intend to back up. This is your reason and motivation for writing. ultimately promote free speech in our nation just as effectively as any binding law. great and too high a price to pay. 2. The overly broad thesis. include specifying a method or perspective or delineating certain limits. Bad Thesis 1: There should be no restrictions on the 1st amendment. 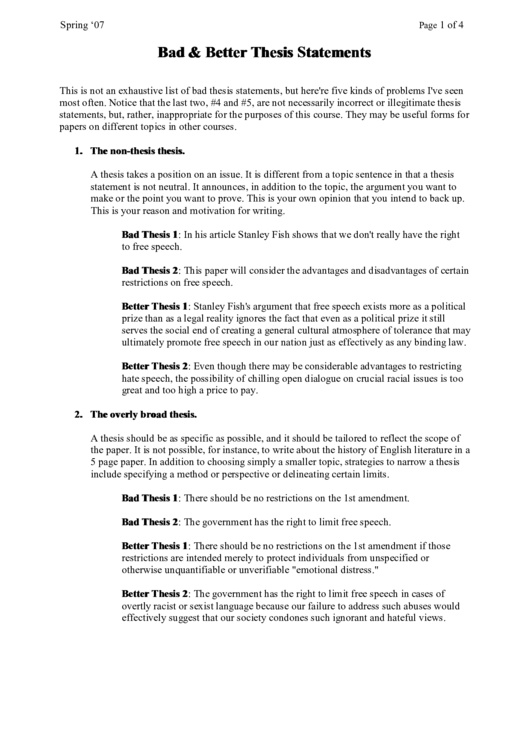 Bad Thesis 2: The government has the right to limit free speech. otherwise unquantifiable or unverifiable "emotional distress." effectively suggest that our society condones such ignorant and hateful views.